This month, the challenge set by Lavender and Lovage for Fresh From The Oven is to make croissants. Watch out for all the attempts on the first of the month by visiting here. I decided not to follow the given recipe, but to use the recipe for Viennese croissants that I found in my copy of Larousse Gastronomique. There was a recipe for a savoury croissant and I thought that it would make a change from the sweet buttery croissants we normally eat. Also, I am very inspired by Sally from My Custard Pie, who each month surprises me with what she makes for this group. My croissants did not rise, so I could not use them in the savoury dish, which meant a whole new recipe was developed to go with my small, tasty treats. My croissant attempt started with reading Delicio8’s post and I began with a sense of trepidation. The dough did not rise and that might have had something to do with me not feeding the yeast as I did not use sugar. In hindsight I should have added the yeast to the milk, and the salt to the water. I then followed the advice from Delicio8 and I started with softened butter – this was as much as a buttery mess and I assume hers was. So, I turned to cold butter which after the second addition I decided needed to be cut thinly. During my second rolling out of the pastry, some stranger decided to walk through my property and the rolling was put on hold while I scrambled to lock the back door, set off the panic alarm and wait for the armed guards to arrive. Turns out the person invading my space was from the telephone company! After that excitement I managed to roll the dough and sort of measure out the triangles. This was the easy bit. But, the croissants did not grow in size at all! They were however as crispy as any I have ever had, and the taste is amazing. Would I make them again? I think not – they are readily available for a Sunday breakfast treat from our local food store. However, give them a try if you have some time to spare, as time is all you need. Your croissants look great! So does your soup! thank you so much SarahJ, and for the follow 🙂 I look forward to reading more of your posts. I’ve never attempted croissants! And I’m not sure why I’ve not after reading your instructions. I bet they taste so superb to any storebought version. Definitely need to put this on my to do list!! Both soup and croissants look awesome! I am a soup lover. I think your croissants look lovely!! 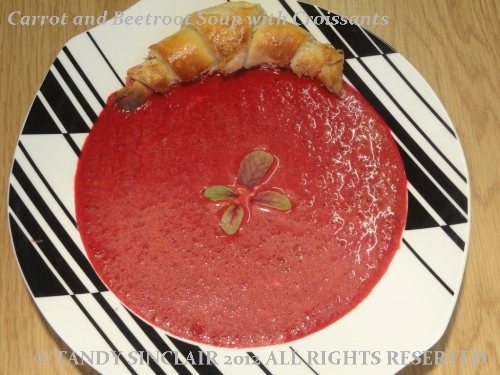 Also I love that you pair it up with a delicious carrot beetroot soup! yummm!! I have always been taunted by them! Well done to you! Sorry these were a bit of a bummer–high, soft flaky croissants are unbeatable! I’d love to make my own, as there really isn’t even a halfway decent bakery around here, but I’m not sure I’m willing to put in the work, haha. I CAN commit to making a raw recipe though, I took on your challenge this weekend and am posting about it tomorrow! Yeah, the fresh baked goods are definitely lacking. There are a few places that do desserts–cupcakes/cakes/etc–well, but nowhere that just does good BREAD, rolls, croissants, etc. The grocery store is really the only option, and that’s just not real fresh bread. Even if you never made these again at least you will know that you can. That’s how I like to think about things that give a real sense of achievement to make but are so time-consuming or easily available in the shops that it doesn’t seem worth it to make them from scratch every time. What an event you had making these Tandy. I desperately wanted to get the croissant recipe from the local baker in Mauritius where Pete and I used to have our weekly coffee and croissant breakfast but alas. I have often wondered if the effort would be worth it. Oh no you too!?! Your’s look pretty good in the picture. I haven’t had the time to re-try this month, the end of the month is going to be constant work for me so I probably won’t be able to enter the second batch into the challenge. (Whenever I get them finished). But I’ve come to the same conclusion as you did, they are inexpensive and easily available, not worth the trouble to make at home I think. I do have to make them successfully at least once though! How scary about the man in the yard, I’m glad it turned out to be nothing bad. Sometimes I wonder if we’ve been so scared by all the news stories of bad things that we overreact. I hate that I don’t feel comfortable walking around the neighborhood without my big dog. I’m glad you decided to post your attempt, so many people won’t post unless it’s successful. They look good to me 🙂 Luckily it was only the telephone guy! I’ve heard these are hard, but puffy or not I bet they tasted great. I admore you for doing this – have often looked at recipes for croissants and then thought..phew, that´s a lot of work. Great soup too! I totally agree!! I have never had the guts to try them, but they look amazing!! Thanks for the mention – you may be very surprised this month as I haven’t even started yet! Thanks for sharing your experience though.